It turned out pretty well, just worked via hacksaw(new blade now needed), file and various grits of sandpaper. The handle is a simple epoxied bit of Ash (i need dowels to make better handles for future efforts, i may try to sell them so no sinew wraps etc) that was split through the pith with a hatchet, and the whole lot had a layer of Sesame Oil for protection, which is still wet in the pics. It cut my evening Lettuce like it was born for the task. Now i just need to find a road-kill Whale and it's destiny will be complete. I have a few more in various different stages too, more care will go into the finish etc for future ones, i just wanted to put this together and see how it worked out. We'll see how the blade holds up to general kitchen use over the next week or two, but i think it will do fine. 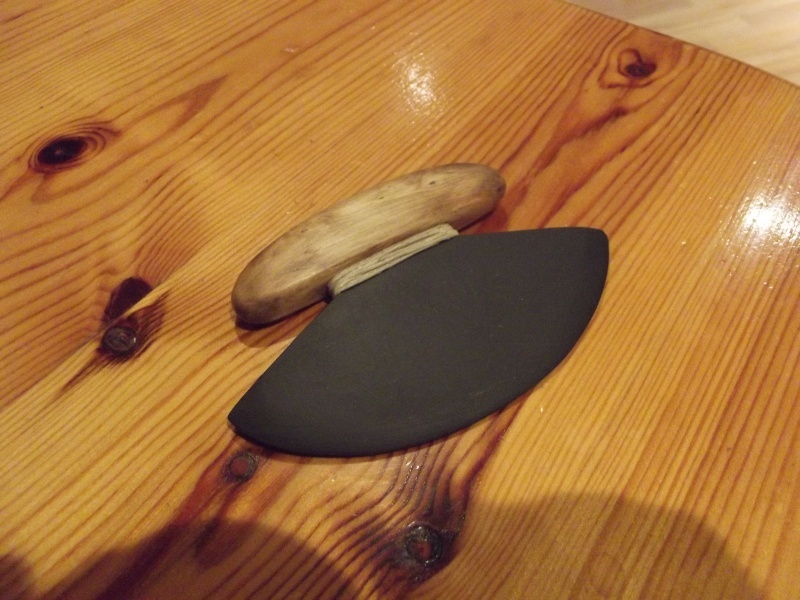 I have a couple of slate tools that I never got round to putting handles on. bah. I went a bit nuts with the belt sander with slate in my old shed in the middle of winter and covered everything in a fine layer of black dust. 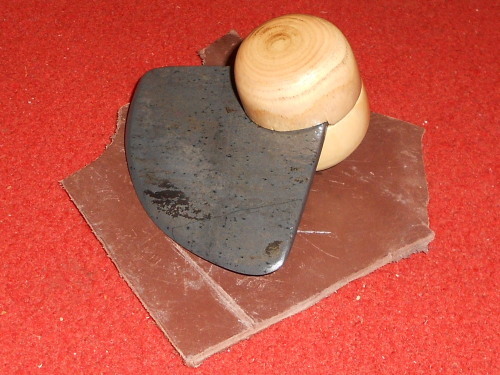 One was a Ulu and the other a spear or a large "Man's knife" depending on how it's hafted. The Ash wood looks good with those growth rings, I've not cut much Ash to make stuff with, me thinks: cut some and put some handles on the slate! I'm bad at finishing stuff too, hence being unable to find my previously unfinished slate blades.... and that dust is so bloody fine too and a PITA to clean up. The belt sander may be overkill though - you can work the general shape of the edge by heavily scraping with the corner of the edge of a flat file, which you can then use more conventionally to smooth the edge out afterwards. 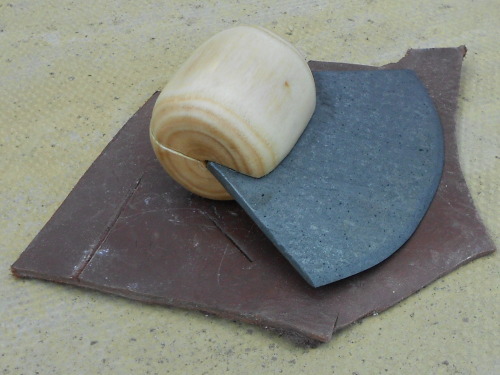 I've also got a piece of thicker slate which i may get a man's knife or two out of at some point, and the article i posted above provides some nice patterns for my next few ulus, as it's the best use i can think of for thin tiles. I have quite a lot of Ash, as i cut a couple of long straight bits a couple of years ago for bow making which never happened... now it's seasoned and it would be a major effort to get a bow out of it i reckon so i'm finding other uses for it, including a possible club. I'm gonna hack up some old Sweet Chestnut bits later, should make gorgeous handles and also better for the task of kitchen work as Ash seems to be a moisture magnet at the end grain, whereas Sweet Chestnut is far more resistant to water. 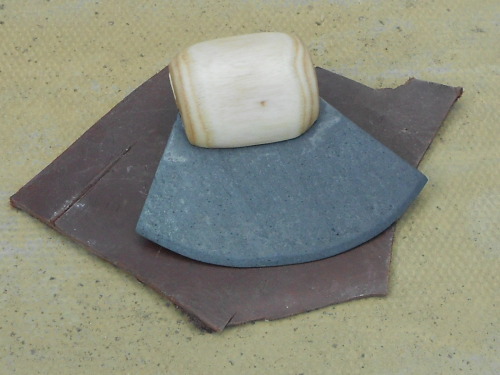 Did you see the pic of a man's knife with a slate blade I posted in the flint and stone knife gallery? It's by that palaeoarts chap in America. Yeah, i'm very familiar with his work - frankly i think he's awesome and he's a big inspiration for my own craft work. The blade I made from a roof tile had a reasonable stabbing point but the edge was pretty useless. I don't know if it was just my roof tile, I even tried baking it to imrove the edge, but no luck. I wonder if natural slate is sharper? An Ulu design seems to indicate that of a something sharp. Some stuff does seem more crumbly than others in my limited experience, but maybe it's the profile of the edge? I ground mine at about 25-30 degrees-ish, then very gently did the very tip of the point at about 45 degrees, thinking that this may make for a more durable edge. This was all with the file, but when polishing with sandpaper/wet n dry etc it probably reshaped it, so i did the 45 degree secondary bevel type thing again with my finest grits (600 and 400 in this case). When chopping on a ceramic plate (a silly thing to do, should have been wood) i think it rounded the edge off very slightly (i'm being way over analytical here, i think), but it still performed the same, not that lettuce is a particularly formidable foe! I finished another this evening.. I made the handle slightly different as i'm experimenting with different shapes, and it's just epoxied again, though i may well drill and dowel at a later date. It was a pain to carve and sand the wood as it was so well seasoned and after finishing so many sticks recently i think i'm done with the "hand tools only" route and i'm getting a blooming sander! 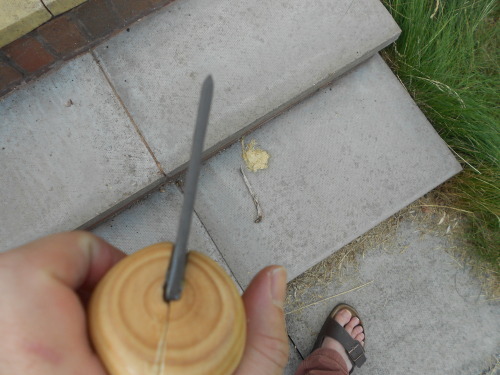 The horrible thin slate dust got into the end grain of the wood too (Sweet Chestnut this time, and it's all just been Sesame Oil'd) and marred it somewhat, lesson learned about not fiddling with the slate while carving and polishing the wood. I'll have to get some old saw blades at a junk shop or car boot and do some metal ones - Ulu's work so intuitively in the hand and are lovely to cut with, if they were metal i'd use them instead of normal knives for a lot of kitchen stuff and not worry about the edge. Here's the bigger Slate piece i have, i thought it was bigger and thicker (f'narr?) and had forgotten that i'd given it a rough shaping ages back. But it's still a fair size, and about half as thick again as the average tile. 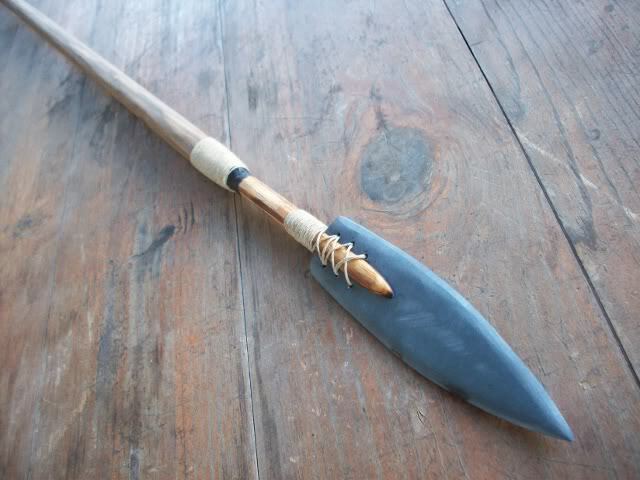 It would make a nice spear head with a lot more shaping, but i reckon i would like to avoid wasting any as i dont have any more. So maybe a couple of "men's knives" instead? I may have to try the groovy hafting like Paleoart's Slate jobbie in the stone knives gallery where the haft continues up the back of the blade and is secured there with sinew. I'll probs have a crack at it sometime next week-ish. Gah, that means more sanding, but at least i'll have had a week off. i really aspire to work like this, so i'd better keep on it! And it seems many Ulus had a concave grind on one side, like a single bevel.. I was thinking of trying a single bevel in a future effort, interesting to know that they were authentically done this way - perhaps skinning/fleshing is much easier that way, it would make sense i reckon and would make for much neater veg chopping. Perhaps the Inuit (etc) were just as picky about slicing their carrots as i am. Some of the North American flint knives had retouch sharpening flakes on one side of the biface rather than flaking on both sides to get a cutting edge. May be the way to go with this type of thing. 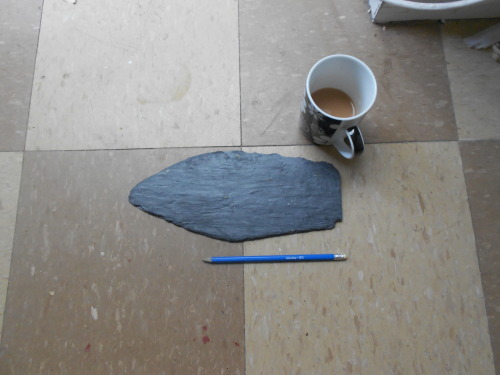 Sainsbury's are selling large, heart-shaped Slate placemats (for dinner plates) at £13 iirc, and it's thicker than tiles, about the thickness of the last (unworked) bit i posted above. Probs enough for 4 men's knives at a guess. The welsh would laugh like drains into their leek and potato soup to see folk buying Slate rather than pulling it out of their garden/family mine but it's not a bad price for craft materials for all those poor folk that have nothing but flint in their local area.
" />Well now this is embarrasing, I finished an Ulu the other day and was going to post a pic. I didn't copy the pic I wanted and instead you have some mushrooms! 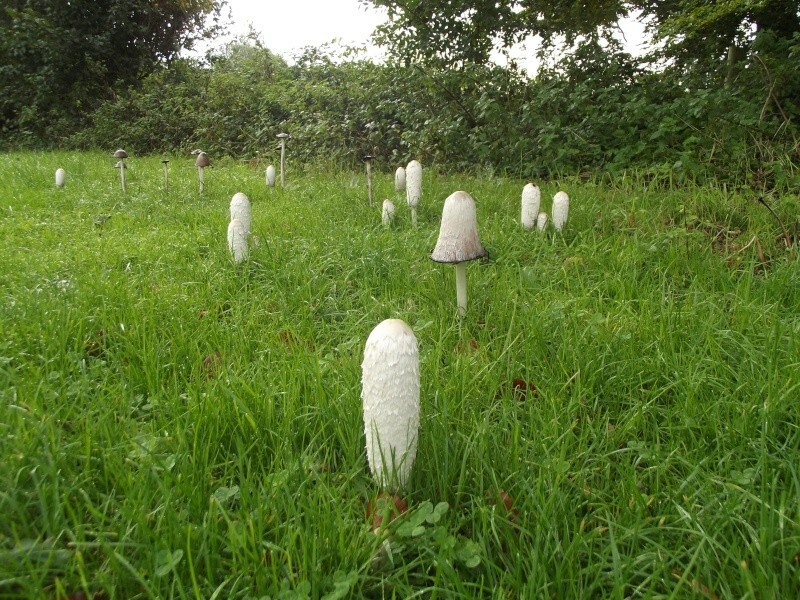 These are Lawyer's wigs also known as Shaggy ink caps and are edible when young like the one in the foreground, though they taste like pap if I remember right. Could you harvest the mushrooms with the Ulu, if so maybe not entirely a disaster. Fair point with the mushrooms, although they will still taste like arse. Found the photo! The handle was caved from Yew and the binding is Hemp which doesn't like the sharp turns at the edges of the slate, hence slightly wobly. Never mind I still like it. Which slate did you use? and how sharp is the cutting edge? Thats real nice looking, very authentic seeming! Does the binding hold things in place somehow or does it just cover the join/glue etc? And i wouldn't eat those either, i have issues with mushrooms too. Particularly how they taste all yak. Even the ones folk rave about make me want to puke a bit. The slate was from an old broken roof slate found in a stack of other broken ones at my local pub, seeing as they where old ones that had clearly been bown off in the past and replaced the piece slipped into my bag before I could ask for permission. 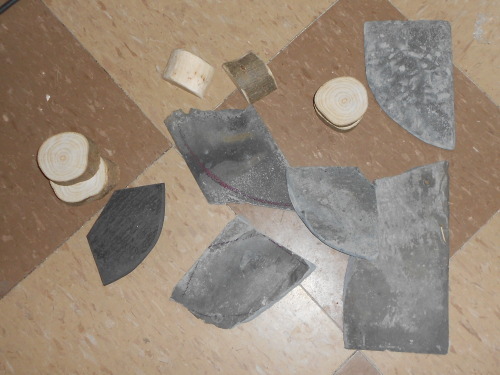 It seemed harder to explain why I wanted a broken roof tile to the staff in a crowded pub than to "recycle" it quietly. I'm a bad person. It's taken a good edge using fine nail files after initial shaping with files, sandpaper etc. The binding just covers the join with the handle which was chain-drilled and trimmed to fit the slate's broard "tang".